ZOMG, new dungeon types in Unity! 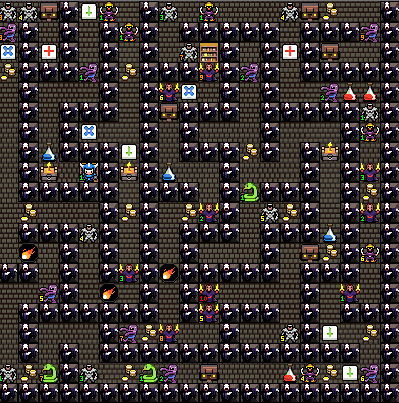 Something that Desktop Dungeons prides itself on is the careful use of space and structures to provide those awesome, randomly-generated dungeon romps. Of course, while each new session creates a unique layout for players to enjoy, the core algorithm that has governed it so far has been … well, pretty much the same all the way through. Heck, the terrain generation system that you’ve seen from the freeware is actually just a merry programming screw-up that accidentally turned out well. That’s about to change. We’re addressing this pretty carefully in the upcoming Unity build. 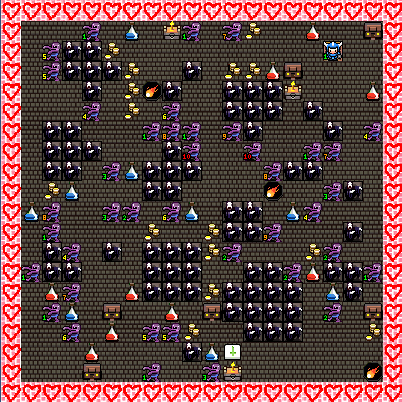 And though our placeholder art may be bewildering and even a bit frightening (especially to the QCF crew, most of whom don’t yet know that I’ve thrown little pink hearts into the dungeon tileset), we’ve got high hopes for our experimentations with dungeon layout, looking at more open-feel levels as well as extra restrictive ones like labyrinths and swamplands. Variable dungeon sizes and juicy sub-dungeons for special set pieces will also be playing a role. Of course, we appreciate the delicate balance of the current system: number of tiles to explore versus freedom of movement and all that other jazz. That’s why we’ll be throwing in quite a few fresh enemy types with their own effects that can (hopefully) give any dungeon’s layout more of an impact and force the player to think adaptively — even in situations that initially appear easy. Stay tuned for further blog posts explaining the weird wall vampires! Huge fan of the game, I’ve played 10s (or maybe 100s) of hours of it. Will the first Unity build also have Android and iOS versions available? The only thing I’d love more than new Desktop Dungeons is new Desktop Dungeons on my phone. I had considered cloning it at one point so I could play it on the go :). Forget the phones. Get this out for iPAD with a price tag!